On Wednesday 14th December Mod Pizza officially opened it doors to the public here in Nottingham,. We were privileged to have been invited to the opening and to sample the goods on offer. 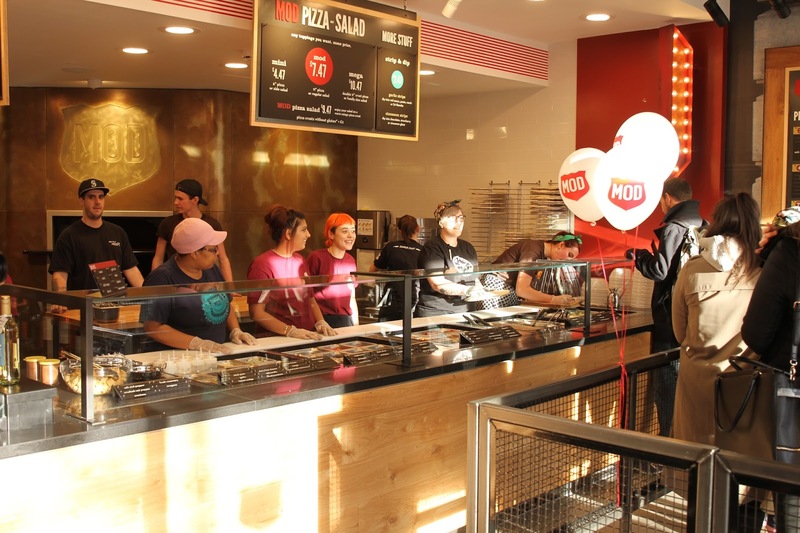 MOD Pizza - Made On Demand- is an American pizza company that started about 8 years ago in Seattle providing a community based restaurant serving reasonably priced good quality food and the rest as they say is history! Look at their web site for more on who they are at; modpizza.co.uk. 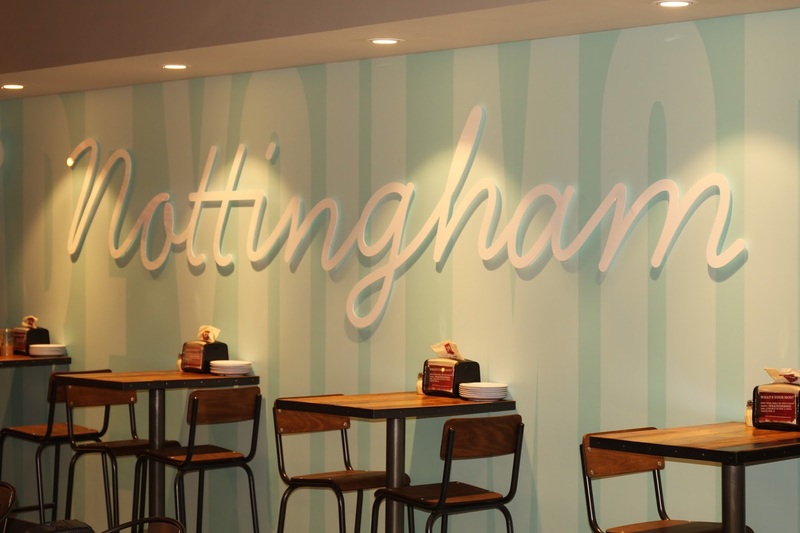 I did have a chance to speak to the manager at MOD Nottingham - Dave - he was very friendly and willing to share on the ethos at MOD. I wont go into to much details but I do want to highlight a few things: Their Staff are paid well above the norm for a job of this type, catering is- and fast food catering staff especially, a low wage career. Often workers have to exist on minimum wage but not at MOD a basic crew member is on over £8 per hour! Also MOD expect their management team to be “on the floor” doing the job, it was refreshing to see the “big bosses” mucking in, I briefly spoke to Celise (apologies if I spelt this wrong!) who is dressed just like a crew member ( And I assumed she was a base crew member) but she was in fact a very senior boss, from the parent company in Seattle! living in the UK helping to run MOD UK. Celise was mucking in clearing tables answering questions helping on the line, at the till, she hardly stopped moving! I only found out later who she really was by talking to Dave! I was great to see senior management on the front line where the rubber hits the road so to speak! Lastly as Mod was created to be a community business they support local charities. This is no different here in the UK, every new store will donate the proceeds from the official opening to a local community based charity. This is nothing short of amazing, I don't know of any other business that has done this. Proceeds from Wednesday's opening went to Epic Partners. So why tell you this? well I am hoping this will make you think and perhaps you're feeling “ WOW! They’re really good lets go have a look for ourselves!” - which is the purpose of this to get you to visit! But we all know its about the food so moving on. 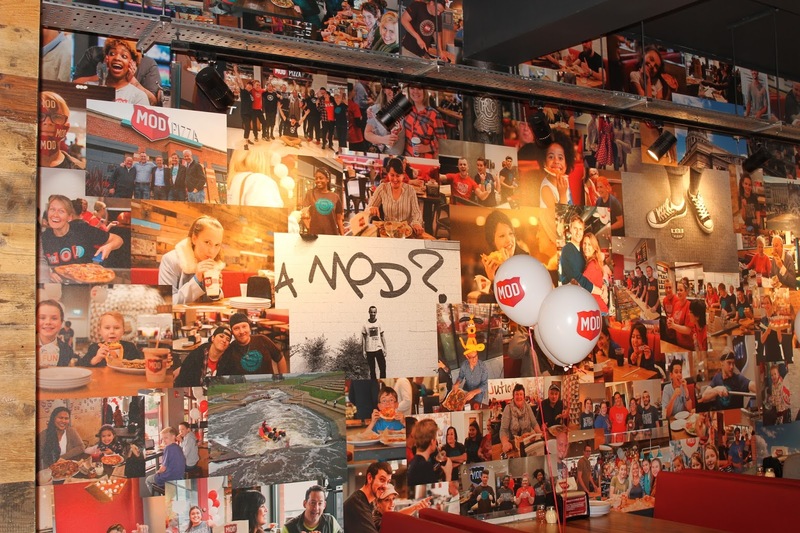 MOD Pizza situated on Long Row in the market square is maybe an updated modernised “American Diner” style restaurant. It has a clean modern exterior with a light and spacious interior, with bright murals on the walls. On entry you come to the queueing area in front of the counter where you create your pizza masterpiece. A large menu explains the options and prices so you can come in and order one of the 9 “Classics” or create one from scratch. As I had been invited to come I was allowed to enter before 12 and meet the team. While having a look around and seeing the line where all the ingredients were all neatly lined up and filled, it was nice to see everything looking so fresh and vibrant. The seating was a mix of tables and benches, tables and chairs, and a high tables with stools. The look and feel is like that of the American diner but more modern and a bright colour scheme through out. On the right side wall in big friendly letter was “welcome” written, on the back wall a mural with hands making a heart shape! Another wall had pictures of people - I guess customers from other stores, it all looks bright fresh and clean. 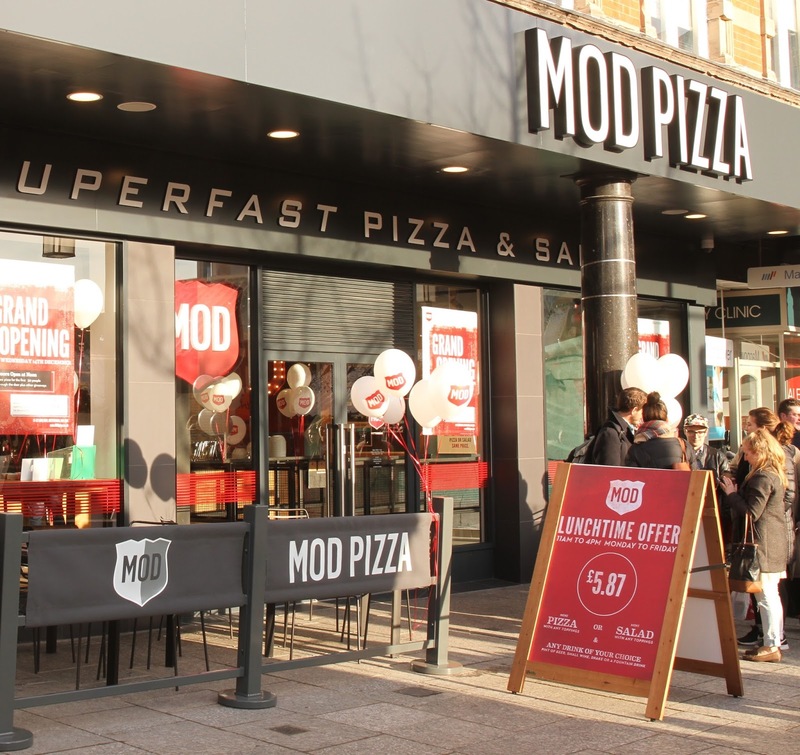 You're greeted by the “Line Staff” who take your name and as you move down the line you see your pizza created in front of you - and even if you choose a classic you still get to add stuff to this as well after all this is “MOD” Made on Demand, MOD-ify the pizza your way! 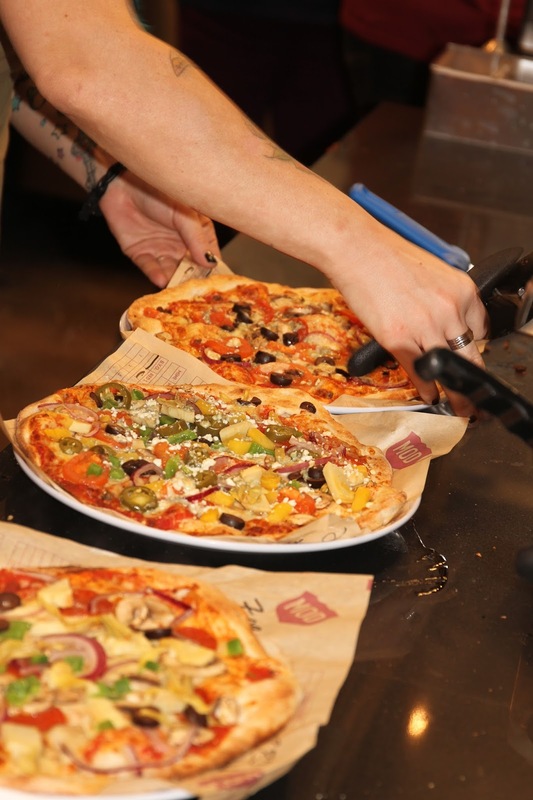 Having created your pizza you move round to the till where there is an impressive array of drinks on offer, bottled beers, wine by the glass and bottle! Prosecco!, flavoured waters, milk shakes, a huge choice. You also have your standard Coke brands but they also offer their own made daily lemonades, ice teas, and sodas. They even do Ice cream floats as well! There is so much choice your bound to find something you really want! Again on the milk shakes you can customise your choice as well. Then having decided on if you are eating in or taking out you pay and then the wait for your pizza commences! The only comment I have to make at this point is that the queueing area is potentially to small, when they opened at 1200 and the first 50 people came in it filled instantly and folk were left queueing out the door. Now this is not likely to happen exactly like this again however, at peak times it could happen which is fine in summer but when its cold and or raining it could lose custom. And so finally to the pizza itself! 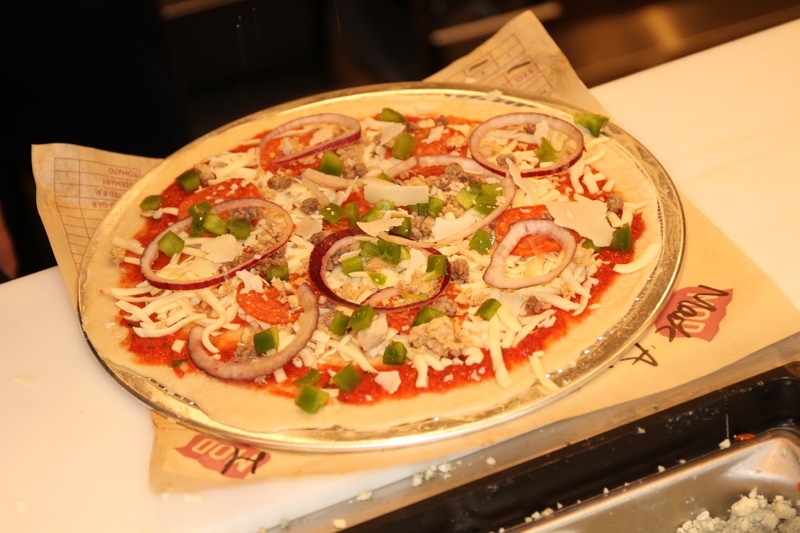 I chose an 11 inch Mad Dog which was pepperoni on a tomato base sauce and mozzarella with mild sausage and ground beef, I added red onions, green peppers and Parmesan shavings as well. As I mentioned before just because you choose a classic you can still add what ever you like to it! My pizza was very good! But then I knew it would be! I created it! The base was crisp but not like a biscuit, it was still a dough after all. The cheese was nicely melted and the toppings looked great. 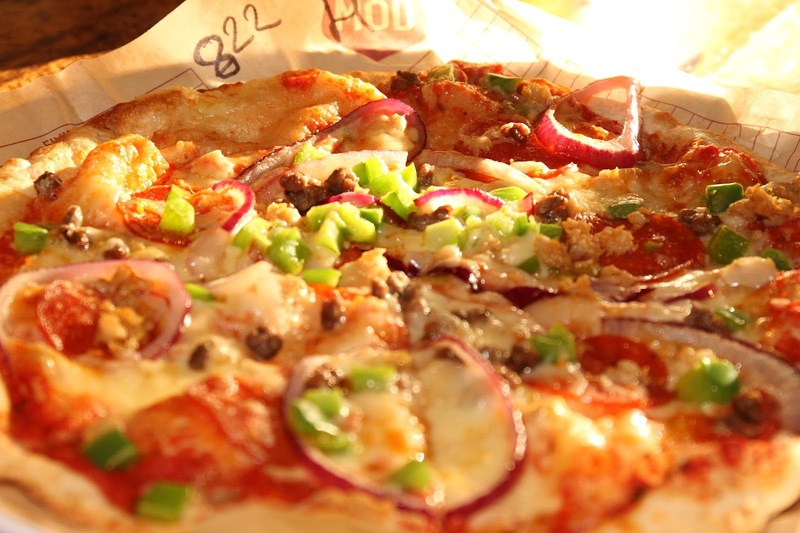 On the taste you get a mash of flavours, the crisp peppers with the sausage then the spicy pepperoni and beef. There were herby tones probably from the red sauce and the sausage. The flavours mixed and melded into a great taste. Though the pizza uses a thin crust, I did find it quite filling so In terms of a lunch it was more than adequate. But what if you’re watching your figure? or don't like pizza! (who in their right mind doesn't like pizza!) then you have salads to choose from as well and again these are made in front of you! Not that hungry? Only need a snack then have a mini pizza at 6inches with all the same choices! If you have a group or are really hungry then there is a mega pizza as well. The choices are there for you to take advantage of. In addition to all the choices on the line once you have your pizza there is a condiments rack by the drinks dispensers with Parmesan, dried chili flakes, salt and pepper and on various tables there were additional condiments as well. Some of the tables even had side plates as if you would buy a selection of pizza and share out between friends. Overall, this was a good experience, the team looked confident and friendly, the management were mucking in helping, leading the team by example! The seating never got really full, there was always some where to sit. The background music was just that, a mix of modern and classic tracks. There was a great buzz of conversation going on all over the place and the customers? Well there was a mix of students, professionals, office, manual workers, mum’s and babies and OAP’s as well. 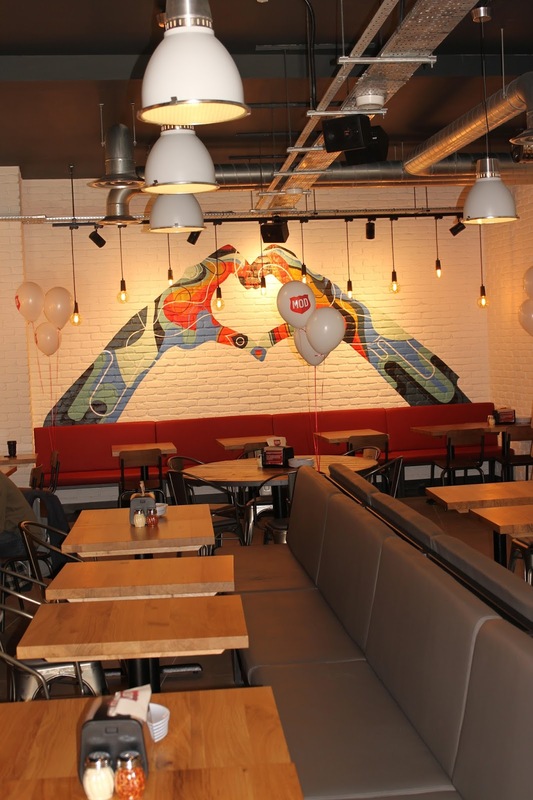 Everyone appeared to be enjoying the food and the restaurant staff busied themselves clearing tables emptying bins and generally keeping the place clean and tidy. All in all, this was a good visit and I can see me popping in of a lunch time when I'm at work for a treat! !